An Ada Lovelace Day Essay: Why Didn’t They Tell Me a Technical Career is All About Helping People? 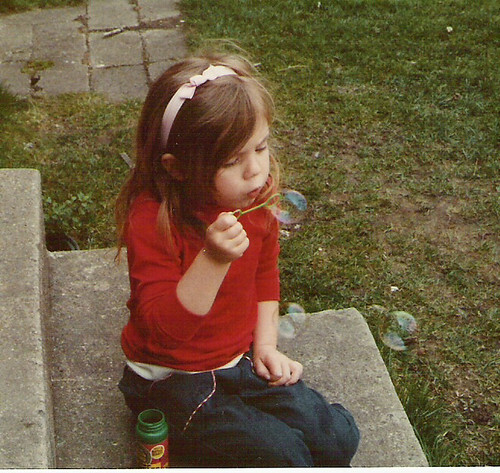 Me blowing bubbles on my grandpa’s back steps, age 3 or 4? When I was a little girl, back when most girls my age were dreaming of being ballerinas, princesses, or veterinarians (a popular choice in my rural community), I dreamed of being the President of the United States. I’m not sure when or why I came up with that idea, I just knew I wanted to help people, and in my little girl mind it seemed like the president got to help all kinds of people. Then one day, I think maybe in 2nd grade or so, we were assigned a class project to draw a picture of our future selves at work in our dream jobs. I drew a picture of myself in the White House behind a big desk, probably with some rainbows and pink and purple hearts. Anyway, as we took turns sharing our pictures with the class, it was finally my turn and I was pretty excited that no one else had wanted to be my dream job yet. So you can imagine how upset I became when a classmate interrupted me to say that could never happen because only boys could be presidents. I promptly started crying, but it was an angry kind of (embarrassed) crying. That kid probably unwittingly planted some of the earliest seeds for my lifelong feminism. I was sure I’d prove him wrong – some day! I never made a conscious choice to work in the field of Information Technology. What started as a student worker position in my university IT department eventually turned into full time job, but even though I was working full time, I spent many years thinking my day job was just a placeholder until I could graduate and get on with my real career. Eventually I realized that the calling for public service I felt from a very young age has been realized by a career in IT, it just took a different path than I expected, and I didn’t think of it that way for so long in part because the narrative society tells us about what it means to work in technical fields is all wrong. Working in Engineering and Information Technology is all about helping people. It isn’t some abstract, impersonal problem solving exercise. I was fortunate to have had early access to a computer and other kinds of technology even as a pretty young girl. My grandpa was an engineer, and the day he taught me how to load up games on his Commodore 64 was life altering. Load “*”, 8, 1 became a passport into whole new exciting worlds and I can directly trace my current job right back to that very first experience. I also knew one of my uncles was a computer programmer, and as I got older, I certainly understood that his job was high paying, challenging, and high status. Another uncle was an engineer too, and I knew he also had a good paying job and everyone seemed to respect his work and his career. All these men in my family, who I loved and respected, who seemed to be judged as some of the most successful career-wise in the family, and yet I had absolutely ZERO interest in doing what they did for a living. Why? Because it all sounded so darned boring. 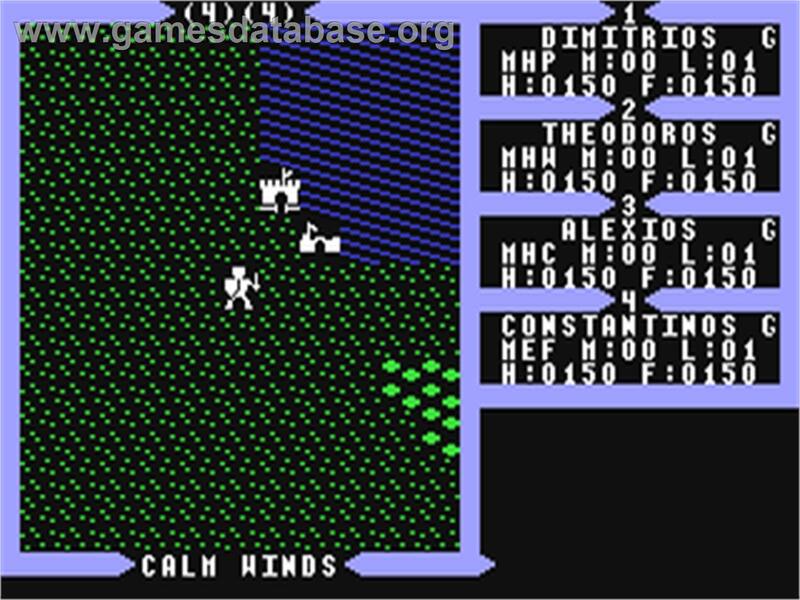 My first game addiction, Ultima III Exodus on the Commodore 64. When I think back to what that young version of me thought of their jobs, I associate all kinds of very dry, abstract concepts and words to their work. It seemed to involve a lot of math. It seemed to be about working with tools and machines and metals. It seemed to have nothing at all to do with other human beings, other people, or about solving the kinds of social problems that I found interesting and compelling as I got older and more conscious of the wider world. Somewhere along the line, I got the idea that technical fields like engineering and computer science were not only off limits for girls, but they were about inhuman, mechanical things, which I had no interest in anyway! What’s funny is that you could excuse this misconception from a young girl growing up in the 80s, but it’s a lot harder to understand how I could still think that way even as an adult actually working in an IT job, and even though my mom worked in IT too! The difference was, my mom’s work stories were always about the people and relationships, so even though she also worked in a technical field I guess I didn’t associate her job in the same way – I thought of her as a people problem solver, not a technical problem solver, and somehow never made the connection between the two. I think what happened is that the information I absorbed about what it means to work in a technical field was focused on the tools used to do the work, not the purpose of the work. And frankly, a hammer just isn’t very interesting. But if you talk about how using a hammer can help you build houses, and building houses helps families have stable, happy homes, then suddenly that inanimate hammer object is placed in a human context that’s tied to something relatable even to the youngest of children. Focusing on the tools used in technical fields is obviously appealing to some people, but it certainly wasn’t appealing to me. Because of these misconceptions about IT work, I spent the early part of my career avoiding the more challenging technical aspects of the job. Partly it was out of fear that I wouldn’t be smart enough to figure it out (girls can’t be system administrators or programmers! ), and partly because I was under the mistaken impression that becoming more technically adept would take me further away from the human interaction that I loved most about my job. It took me years to discover that I was wrong on both counts. Perhaps if someone had helped me connect the dots, it wouldn’t have taken me so long to discover how thrilling it is create something new that people find useful or valuable, or how wonderful it is to empower others to use technology for their own goals. Me explaining the architecture of the University of Cincinnati’s OpenSimulator grid. I think the way we frame the narrative of technology work has a lot to do with why girls and women choose other career paths. Even today, I doubt many people would associate working in technology with public service, even though in large part, the purpose of our work is about solving human problems, improving living conditions, and making society better. We just don’t talk about it that way. And we should, because for all the little girls (and boys) who are drawn to the human elements of a particular career, we want them to know that IT and engineering jobs can be very human centered! Yes the programming and software and protocols are necessary to do the work, but that’s not why we do the work – we do the work to make the world a better, safer, more interesting and beautiful place, just like doctors and veterinarians and ballerinas – and (hopefully) presidents. Ada Lovelace Day aims to raise the profile of women in science, technology, engineering and maths by encouraging people around the world to talk about the women whose work they admire. This international day of celebration helps people learn about the achievements of women in STEM, inspiring others and creating new role models for young and old alike. Ada Lovelace is widely held to have been the first computer programmer. Close friends with inventor Charle Babbage, Lovelace was intrigued by his Analytical Engine and in 1842, she translated a description of it by italian mathematician Luigi Menabrea. Babbage asked her to expand the article, “as she understood [it] so well”, and this was when she wrote several early ‘computer programs’. Ada Lovelace died of cancer at 36, her potential tragically unfulfilled. Learn more about Ada Lovelace and do your part to support women in science, technology, engineering, and math! This entry was posted on Tuesday, October 16th, 2012 at 5:35 pm	and is filed under Culture, Deep Thoughts, Digital Citizenship, Education, Gaming, History, Technology, Women. You can follow any comments to this entry through the RSS 2.0 feed. This is fantastic and absolutely right! Very enlightening!